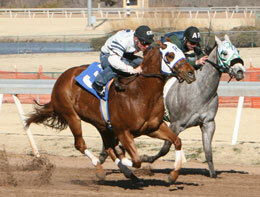 Training lessons for 2-year-old's continued today in preparation of the upcoming Remington Park Quarter Horse meet. OKLAHOMA CITY, OK�FEBRUARY 14, 2013�Randy and Stacy Charette-Hill's Send Me This Wagon topped Remington Park's two-year-old training races today (Thursday) with a time of :13.51 for 250 yards. The track, which had been forced to cancel training races last week due to weather conditions, hosted 10 two-year-olds races today with 72 head making their debut. Stacy Charette-Hill also conditions the PYC PAINT YOUR WAGON filly from the first crop of the Mr Jess Perry mare Jess Send Me Candy, a half-sister to stakes winners Send Me A Candy Tree ($285,974), This Candys Special ($100,361), This Candys Royal ($55,046) and stakes-placed winner's Eyesa Candy Maker ($106,494), Send The Candy Wagon ($61,332), Eye On This Candy ($56,916) and Eyesa Candy Horse ($55,554). Bred in Oklahoma by Michael Pohl, the filly took over from the middle of the track and was not asked in the easy three-quarter length win over Ms First Prize Paris, who held the day's fourth fastest time of :13.63. PYC PAINT YOUR WAGON had two winners on Thursday's training card. For a complete list of today's training results CLICK HERE. Training race replays are available for viewing on www.oqhra.com.